The Donald Trump tax plan will help the middle class while punishing hedge fund managers and companies that have sent American jobs overseas. That's according to the hints that leading Republican presidential candidate Donald J. Trump has dropped so far. "We have an amazing tax plan," Trump said on the CBS News program "Face the Nation" this past Sunday. "We're going to be reducing taxes for the middle class, but for the hedge fund guys, they're going to be paying up." Trump has dominated most of the polls in recent weeks. According to the Real Clear Politics average, he has the support of 30% of the Republican voters, compared to 20% for retired neurosurgeon Ben Carson. Former Florida Gov. Jeb Bush leads the rest of the pack with 7.8%. 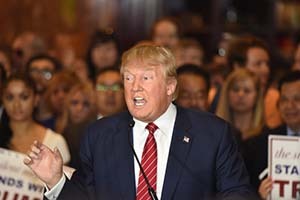 While the Donald Trump tax plan has not yet been released – the real estate magnate has promised to unveil it in about two weeks – we already know several of its key points. Some of the Trump tax plan details have come out in interviews, while others can be inferred from his 2011 book, "Time to Get Tough." In that book, Trump described several tax proposals. It's likely many of those ideas will form the foundation of the 2015 Trump tax plan. One part of the Trump tax plan that he has discussed concerns hedge funds. Right now, hedge fund managers pay a 20% capital gains tax, although their income would otherwise push them into the top 39.6% income tax bracket. Trump has said that hedge fund managers are "getting away with murder" and has pledged to increase what they pay. But he hasn't explained exactly how he will do this. The Trump tax plan will also feature greatly reduced taxes on businesses. Right now, the U.S. corporate tax rate is 35% – among the highest in the world. It's the main reason about $2.5 trillion in U.S. corporate profits are sitting in overseas bank accounts. No politician, either sitting or running if ANY Party , is going to be able to substantially reduce overall government spending at any level. So, all the (happy) talk and promises, as enticing as they may sound, fall far short of reality on the spending cuts side of the ledger. Of course, the biggies in the Federal budget are politically untouchable: Medicare, Medicaid, Obama Care, and Social Security. In fact, the Social Security Disability Trust Fund (SSDI) is going to go cash flow negative in 2016. There is no current proposal to fix it, other than to merge it with the Social Security Trust Fund and hide the problem. In the end, Federal taxes must go up or scheduled entitlement benefits must go down- no two ways about it. Presidential debates are designed to avoid the real thorny issues and concentrate of the personalities and easy stuff ( or fluff ), not the hard choices that the next President will ultimately face. He can run, but he can not hide. Not true….Social Security……is not Broke……in 2016 or anytime soon…! Perhaps all income should be taxed. This would include all government benefits, realized & unrealized capital gains (losses), and earnings of equity holdings. Taxation of equity earnings should replace the business income tax. Contributions to foundations and trusts should also be taxed to the extent that they have not already been taxed. All income up to a standardized deduction and a standard exemption could be taxed at 1% with the remainder taxed at no more than 10%. Every US citizen should be require to file an income tax form. This would encourage the moochers to become productive citizens. This is not a bad idea at all. No one should be exempt from tax, no special cases or conditions. That's not true about hurtin the US Treasury……only the media would b******t the Public! GAME is just like playing MONOPOLY…….Go past GO and Collect……. American TAX PAYERS Donate more Currency than any other COUNTRY in the WORLD.! Every Media Group Plays the Hardship of the Euro-Zone…..especially about Greece…..! I'm with TRUMP…….As he States…. "wanna play the Money Game…Let's Play"
Remember all you Younger Kids/Teenagers……….DO YOUR MATH….and……then you will be able to determine all the Truth about the Media Bologna…..!!!!!!!! !